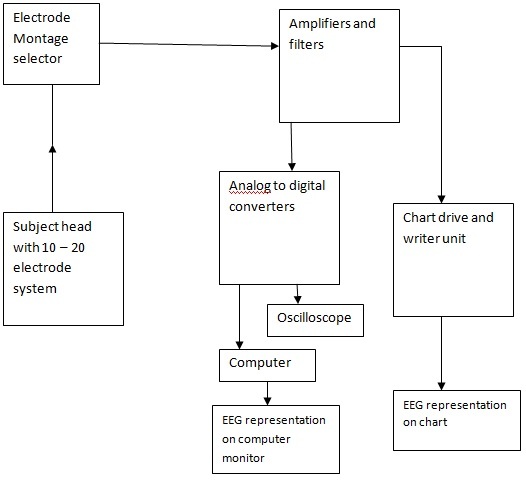 The basic block diagram of an EEG machine is shown above. The function of each block in the system is described below. Montages are patterns of connections between the electrodes and the recording channels. The montage selection switch is used for selecting a particular channel. Different channels convey different information. Montages are always symmetrical and hence in the 10-20 electrode placement system the electrodes are also placed symmetrically. The EEG signals are transmitted from the electrodes to the montage selector panel. The montage selector of an EEG machine is a large frame which consists of different switches so as to allow the user to select the desired electrode pair. The function of pre-amplifiers in the EEG measuring system is clear from the name itself. As the EEG signals are having amplitude levels in microvolt range it is compulsory that they are to be amplified before further processing. It is to ensure that the information from the EEG electrodes is not affected by any external noise. We normally use high gain, high CMRR operational amplifiers as preamplifiers due to its versatile features. The muscle artifacts (noise) are a major problem regarding the EEG waveform. These noises can make the representation dishonest. So we have to filter out these noise contents. This function is done by a bank of filters in the EEG machine systems, which are selected according to the need. Amplifiers are used here also to improve the amplitude levels of EEG waveform. For the detailed analysis of the EEG waveform, we use computers and oscilloscopes. As the computers only accept digital data we have to convert the analog EEG information in to digital form. The function of ADC is to convert the analog EEG signal to digital form. Thus the computer can store the EEG waveform for future reference. The writing part of an EEG machine is usually consists of an ink type direct writing recorder. The recorder will be a chart paper which is driven by a synchronous motor. For the clear representation of the EEG waveform an accurate and stable paper drive mechanism is provided by the synchronous motor. Also there are provisions to control the paper speed. The schematic of an early EEG is shown in figure above.